Purpose: Use this document as a reference for creating a purchase order inctcLink. ctcLink Asset Management can interface with other ctcLink products to exchange information efficiently. For example, you can use Purchasing to create a Purchase Order for an asset and later add the asset from the existing Purchase Order and receipt. 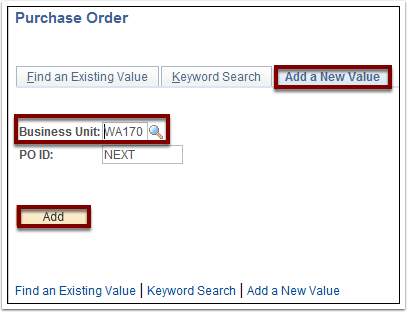 Use the Add a New Value tab of the Purchase Order page to enter add a new value. 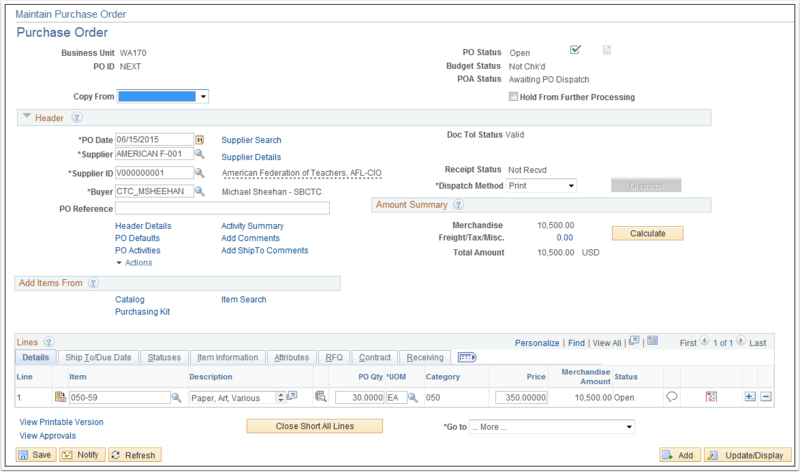 Use the Purchase Order page to add purchase order information. Enter or select the appropriate supplier in the Supplier ID field. 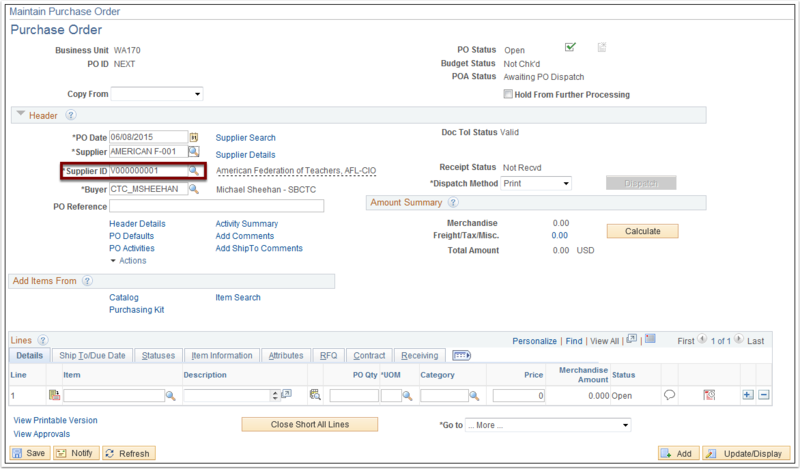 Enter or select the purchase order item in the Item field. Enter the item quantity in the PO Qty field. Enter or select the item unit of measure in the UOM field. Enter the cost of the asset in the Price field. Use the Schedules page to specify ship-to locations, quantities, due dates, comments, sales/use tax, miscellaneous charges, price adjustments, and multiple distributions per schedule within a purchase order line. 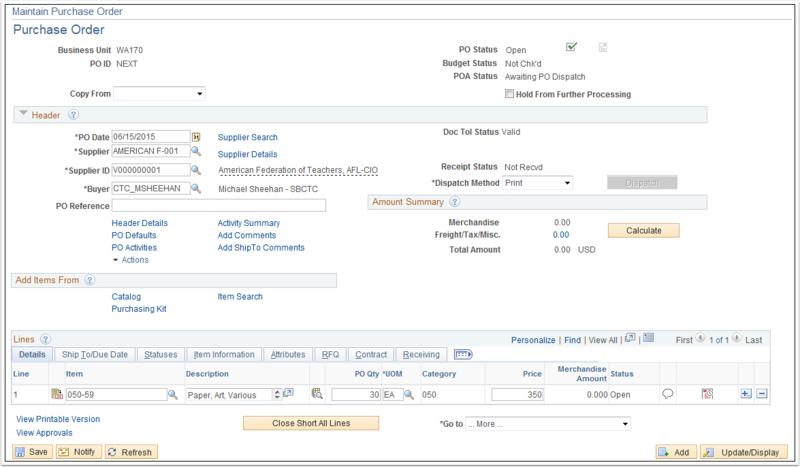 Use the Schedules page to define ChartFields for each purchase order item. Enter or select the operating unit in the Oper Unit field. Enter or select the appropriate department in the Dept field. Enter or select the appropriate class in the Class field. Enter or select the appropriate fund in the Fund field. Enter or select the appropriate purpose in the State Purpose field. Note: If the PO item is an asset, you would need to click the Asset Information tab and complete the AM Unit and the Profile ID fields as well. Enter or select the appropriate business unit in the AM Unit field. Enter or select the appropriate asset profile in the Profile ID field. Click theReturn to Main Page link. If it is active, you can use the Dispatch button to print, email, fax, etc. the PO.